Andy Teuber serves as the Chairman and President of the Alaska Native Tribal Health Consortium (ANTHC); a position he has held since 2008. Teuber has also served as the President and CEO of the Kodiak Area Native Association (KANA) since 2006. He is an enrolled member of Tangirnaq Native Village (a federally recognized tribe). He holds a Master of Business Administration degree from the University of Washington. In addition to his day-to-day career, Andy operates Kodiak Helicopters, LLC in Kodiak. 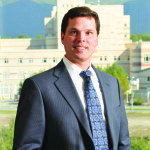 He is active in the community and serves on a number of boards that include: University of Alaska Board of Regents, Alaska Federation of Natives, Alaska Community Foundation, Alaska Airlines Community Advisory Board, Tangirnaq Council, and the U.S. Department of Health and Human Services Secretary’s Advisory Committee.